Deontay Wilder needs to realize he’s not the A-side for the Anthony Joshua fight, according to Floyd Mayweather. The A-side guy is Joshua in this heavyweight unification fight, says Mayweather. Joshua is the one that’s bringing in the big viewing numbers and the high pay-per-view results over England. Wilder has still yet to make the leap to PPV in the States, and he never get to that point in his career. Wilder is asking for a 50-50 purse split for a fight with Joshua, and that’s holding things up. The fight can’t get negotiated as long as Wilder wants the same money that Joshua brings in. Mayweather doesn’t see it as even for discussion. Joshua is the A-side in the negotiations, period. If Wilder continues to ask for a 50-50 deal, he could price himself out of the Joshua fight, and end up having to finish his career out without ever having been involved in a mega-fight. “Everybody’s overlooking Anthony Joshua,” said Mayweather to Fighthype. ”Joshua showed the heart of a lion, got hit by one of the Klitschko brothers, got right back up and kept fighting like a warrior. Anthony Joshua is the A-side,” said Mayweather. Joshua does bring in better numbers in the UK than Wilder does in the U.S. Joshua is getting bigger paydays than Wilder. If that counts for anything, Joshua is the one that commands bigger audiences in the UK in fighting in stadium. Wilder isn’t a stadium fighter. For Wilder to become that type of heavyweight, he would need to completely overhaul the level of his opponents, and make some tweaks with his showmanship outside of the ring. Muhammad Ali fought in front of large crowds in a few of his fights during his career, but he had stage presence that Wilder possess. “If the fight does happen, I think it can happen in the UK,” said Mayweather. ”I think It’s bigger money in the UK. That’s just my opinion. I think everybody is overlooking Anthony Joshua. This is a guy that’s a gold medalist,” said Mayweather. Joshua vs. Wilder might be a big enough fight to stage it in a stadium in the UK. It probably isn’t a big enough fight to place at Wembley Stadium in London, England. It’s not that kind of a fight, but it might draw big numbers of they place the fight at Principality Stadium in Cardiff, Wales. 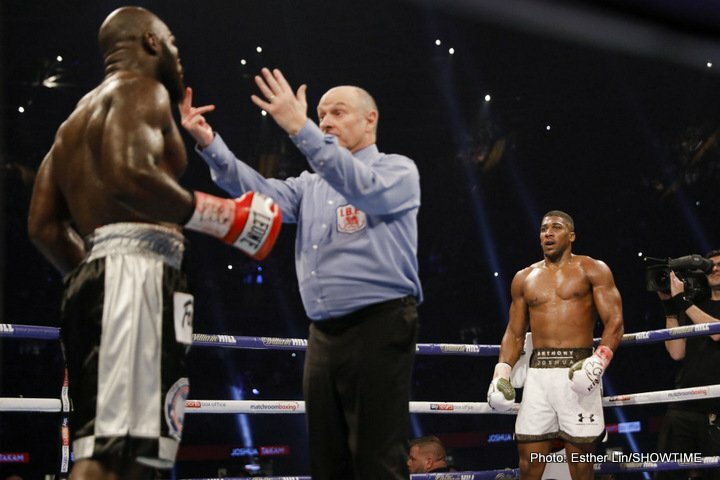 Joshua brought in a lot of boxing fans for his recent fight last October against replacement opponent Carlos Takam. Next boxing news: Canelo-Golovkin: Which one will adapt better in rematch?